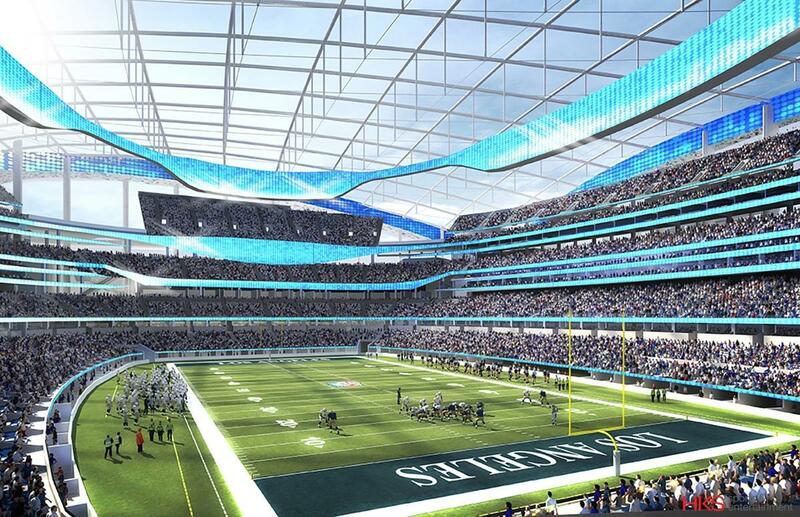 Los Angeles court battle heats up as architects start working at home St. Louis Rams' new Archi-new - Free Dwg file Blocks Cad autocad architecture. Archi-new 3D Dwg - Free Dwg file Blocks Cad autocad architecture. Work has begun on the Los Angeles development being earmarked for the relocation of American football franchise the St Louis Rams, just days after the local council put together a deal to keep the team in Missouri. According to the Los Angeles Times, the National Football League (NFL) team’s billionaire owner Stan Kroenke is pressing ahead with the plans to build a US$1.86bn (£1.3bn, €1.69bn) mixed-use development – which includes a 80,000-capacity stadium, hotel, retail space and a man-made lake – despite the location of the franchise still being up in the air. Kroenke proposed the HKS-designed development of the Hollywood Park site in January as he attempts to move the team west. It is one of three bids being made by NFL businesses to bring the sport back to the Californian city for the first time since 1994 when the Rams left Anaheim. Plans for the stadium include a sail-shaped roof that’s twice as big as the arena and an adjacent 6,000-seat performing arts venue. The site is being prepared, and if the developers get the green light from the league, stadium construction can start within a couple of weeks. Fellow franchises the Oakland Raiders and the San Diego Chargers are competing with the Rams to build a stadium in Los Angeles. They have combined to propose a joint, 70,000-capacity stadium designed by Manica Architecture. Their US$1.86bn (€1.68bn, £1.24bn) proposal envisions a futuristic bowl featuring a 120ft (42m) glass-encased tower. In a bid to keep the Rams from moving west, the St Louis city council has agreed to spend US$150m (£101.2m, €136.7m) to help finance a riverfront football stadium designed by HOK Architects, which is expected to cost in the region of US$1bn (£675m, €911.1m). The proposal states that rest of the finance would come from the team owner (US$250m, £168.7m, €227.8m), the NFL (US$300m, £202.5m, €273.3m) fan seat licenses (US$160m, £108m, €145.8m) and from the state through taxes and credit bonds. However, a correspondence sent by NFL commissioner Roger Goodell to Missouri governor Jay Nixon explaining that the league provides a maximum of no more than US$200m (£135m, €182.2m) to help teams build new stadiums may prove to be a spanner in the works. The city agreement, which saw councillors vote 17-10 to approve the measure, does not guarantee that Kroenke has to keep the team in St Louis, while a special meeting for NFL owners scheduled for 12 and 13 January 2016 is expected to resolve which franchise will be chosen to make the move to Los Angeles. NFL rules require that 75 per cent of the 32 owners must approve the move and only one bid can be accepted.